First Line: "Oliver disappeared after school on a Friday afternoon, way back when we were in second grade, and small things seemed really important and important things seemed to small." 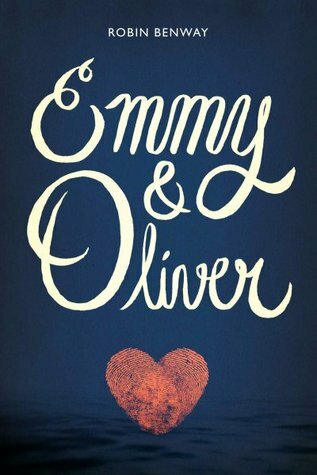 Review: Emmy and Oliver turned out to be more than what I expected. From that cover I thought I was going to get a sweet romance but it was more than that. It was about growing up, family and discovering oneself. Oliver and Emmy were next door neighbors and best friends if not on the way to becoming more but one day Oliver doesn't return after spending the weekend with his dad because his father decided to kidnap him. A decade later Oliver is found and his world is pretty much turned upside down. He was lied to by his father and doesn't know what to think anymore. He was a very conflicted character because a part of him still loved his dad very much regardless of what he did because his dad and the life he had with him was all he knew and now he finds out his mom didn't abandon him and he was missing the whole time he was living his other life not to mention because he was abducted at such a young age he barely remembers anyone including Emmy. As far as Emmy goes her life was affected deeply by Oliver's kidnapping. Besides the fact that she lost her best friend that day, her life would never be the same. Her parents are extra protective of her in fear of what happened to Oliver she has to sneak around to do the one thing she loves the most and there hasn't been a day that has passed that she hasn't thought of Oliver. Both characters were very likable and my heart broke for each of them for different reasons. I loved that the parents were not absent in their lives like a lot of young adult books, there was conflict on both sides between Oliver and his mom and Emmy and her parents. Also two other notable characters that are worth mentioning is Caro and Drew they were Emmy's friends and also knew Oliver from when they were kids and I have to admit they were great friends with their own issues that they were dealing with. Overall this was a great coming of age story and I highly recommend it. ~"Sometimes love isn't something you say, it's something you do"